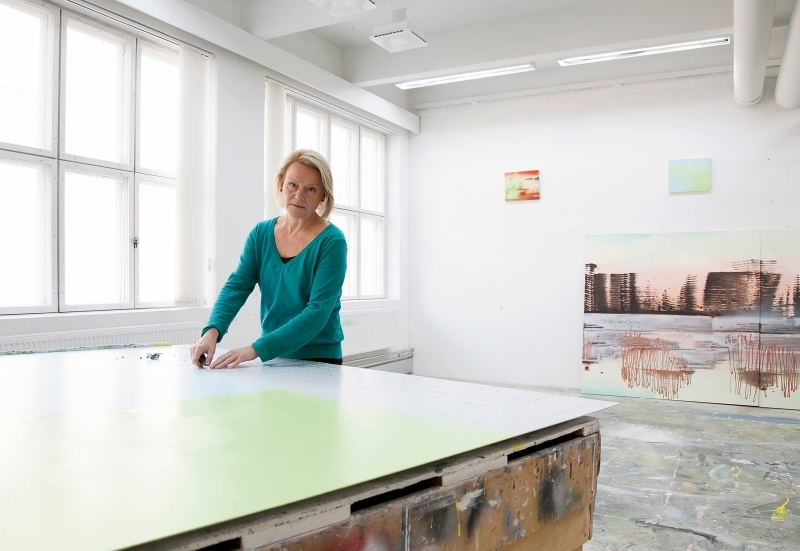 Painter Kristiina Uusitalo and photographer Mia Damberg have both been making art for over 20 years. They took part in the first SHIFT mentoring programme in autumn 2015 and are the most experienced ones in the group. Now FAA would like to shortly introduce them for those who haven’t been following Finnish art scene so closely. At the moment, painter Kristiina Uusitalo is working on new paintings for her upcoming solo exhibition in Gallery Heino in April (2.4.–24.2.2016). “One of my topics is accelerating environmental change – things are not what they seem to be. The colours and elements in my paintings have been chosen when thinking about the collision between living and non-living, carnality and changing ground. But because the grey area between extremities is wider, we are standing between associations and reality.” Uusitalo describes. “When I turn my eyes towards something that is weird, scary and obnoxious, it gradually becomes understandable and sympathetic.” As a preface to her works, Uusitalo cites Brazilian writer Clarice Lispector (1925–1977), who describes a surprising road to love for all living in her book The Passion According to G.H.. Sameness of everything, even imperfectly is the greatest possible change of thinking. Artist Mia Damberg is not only a photographer but also a craftsman who creates every set piece by herself. “I start building the set through memorising details from my own childhood. It can be an object, feeling, word or something really small. If it’s an object, for example a piece of clothing, I start with sewing, crocheting or knitting the object. If it’s a room, I start with room props to create the similar feeling through wallpapers, furnitures, light and colours” Damberg narrates her working process. She sees her works quite humorous even though to some the topics are quite serious. 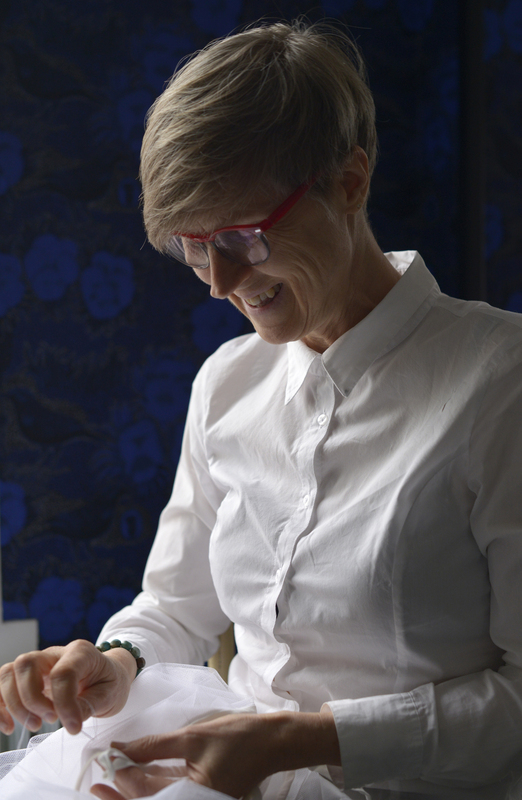 “Sometimes I burst out laughing while examining a detail or a vibe I want to create. While sewing or building I have time to think about the next move. I trust my intuition which often proves to be correct.” Damberg uses few regular models but sometimes she asks people in the streets if they would like to pose in her works – fortunately no one has yet refused. When people realise that being a model is something positive they are happy to be part of the process. The final photograph forms during the shooting, and sometimes it has also happened that the final result is better than expected. “Such things may arise from model’s expression, pose or something that is impossible to describe. In turn, sometimes everything can go wrong, but that’s how it goes” Damberg closes. At the moment Damberg is working on a solo exhibition opening in Finlandia House Veranda gallery in the beginning of March. “Work, go to the studio even though you are not inspired, talk about your works with colleagues, accept and learn from criticism, believe in your work when nobody else does, and get a manager!” Damberg advises emerging artists. It’s hard to believe that getting an exhibition space can be so hard for older artists, even though they are the ones who have gained more experience, knowledge and wisdom that’s transmitted through their works. “It’s quite a mystery how artists become known for the bigger audience – through luck maybe?” asks Damberg. “I wish I would have realised earlier the need for ‘outside help’, or I didn’t know where to search for it because rarely those without galleries are offered any help” notes Mia Damberg about the SHIFT programme. “Exchanging ideas with somebody external is always useful. People beside you can encourage and question your work in a fruitful way. For some it’s always more natural to bring people together” adds Kristiina Uusitalo. Creating new contacts and exhibition possibilities were few of the aims in the first mentoring programme. This is the second part of the series introducing our SHIFT mentoring programme participants in 2015.